The mid-point of winter having been passed at the winter solstice (Dec 21), the days are now slowly growing brighter. Imbolc is often called the “rekindling of the solar hearth” and celebrates the returning sun, the promise of spring, and the steadily improving weather. It’s a very important time for farmers, who depend upon the whims of the weather. Tradition holds that the weather on Imbolc is a predictor of the year to come: too cold/wet/stormy and a bad year is predicted (although in typically pessimistic Irish fashion, if the day is too nice that’s thought to presage even worse conditions!). Weather that’s just a little better than expected is thought best, promising a mild conclusion to winter and a fertile year. There is some dispute to whether Imbolc represents the mid-point of winter or the beginning of spring. While January and February are usually the coldest months of the year in central Europe, the British Isles are tempered by the Gulf Stream, so February is often milder than January. Thus, there are different definitions of what exactly defines winter. The cultural tradition in most of the northern hemisphere is that winter consists of December, January and February (this is also known as the meteorological calendar). The astronomical tradition holds that winter begins on the winter solstice (December) and ends on the vernal equinox (March). However, in Ireland winter is regarded as beginning on Samhain (rounded to November 1st) and ending on Imbolc (or the last day of January). This is the system I was taught in primary school, and it caused a little confusion when I first moved to the US, until I learned the origins of what’s known as the Gaelic calendar. Brigid/Bríg is the Celtic goddess associated with Imbolc. One of the Tuatha de Danaan, Brigid was the herdswoman of the gods, she tended to both the livestock and the hearth and home. A fire goddess, she was also thought to be responsible for the kindling of desire: the desire for knowledge as well as the desire for procreation. She is the Celtic patron of poets and metalworkers, of divination and healing, and the goddess of inspiration — anything that needs a creative spark, or a flame kindled. The respect the ancient Celts held for this goddess is reflected in their practice of giving the prefix “brig” (meaning meaning “high” or “strong’) to special places and respected people. The traditions associated with the goddess Brigid were transferred onto St. Bridget of Faughart as the church sought to rebrand Christianity using the trappings of the old pagan beliefs. Consequently, the many rituals associated with Brigid the goddess are hard to detach from those now associated with the Catholic saint (a no-doubt formidable nun who founded a mixed monastery in Kildare). On Imbolc, households would extinguish the fire and rake the ashes smooth before going to bed. In the morning, they’d look for a sign of the goddess’ passing, and hence her blessing: a footprint or mark in the ash. After a ceremonial feast, each family would make a cross of reeds or straw (a symbol long pre-dating the Christian fascination with the cross). The symbol is one of many prehistoric symbols representing the sun, the return of which Imbolc celebrates. Other rituals include leaving a bowl of salt, water or a piece of ribbon or cloth outside for Brigid to bless on her way around the households in the area. This blessed substance would then be reserved for special use during the year, primarily for healing purposes. The tradition of this “cloth of St. Bridget” is still practiced in parts of the west of Ireland. 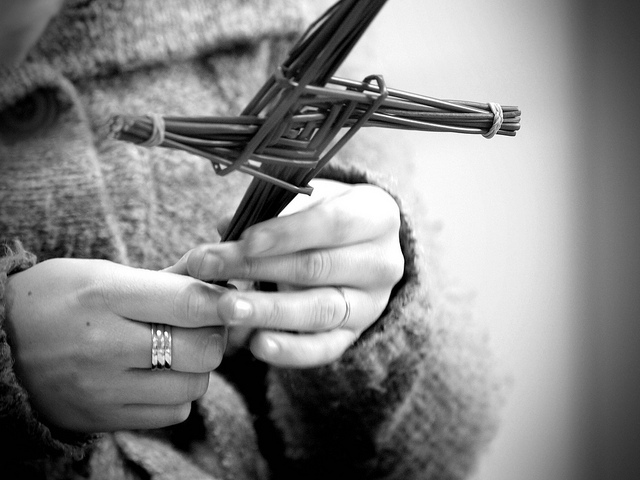 The rituals and symbolism surrounding Brigid are mostly to do with fertility and increase: a straw doll (known as a brideog) of the goddess would be made and placed in a crib by the hearth, Brigid’s cross would be placed under a mattress on a wedding night, or a butter churn might be dressed up as Brigid. 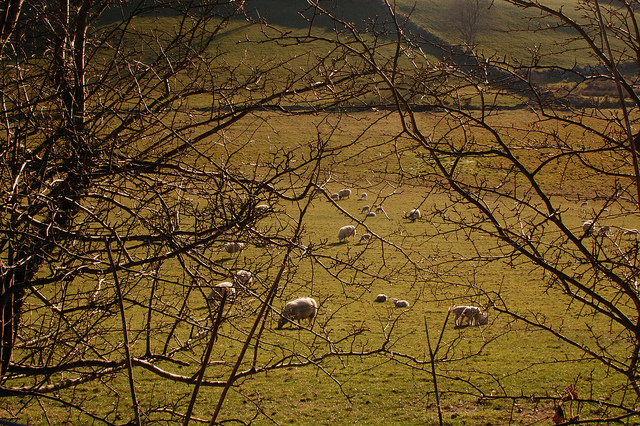 Imbolc comes at the time of year when ewes are pregnant, and the birthing of the first spring lambs often follows shortly afterwards. So, whether you’re celebrating Imbolc or just in need of something positive to get you through the dark cold of late-January, happy spring! This is the first in a series of posts about Imbolc, Brigid, and sites associated with St. Bridget in Kildare. Hi Rich .. great minds think alike and all that .. just posted about Imbolc! Lots of lovely info here .. couldn’t get your “Like” button to work!